Within Teamwork Projects, you can organize all of your tasks, milestones, messages, notebooks, files and other items in projects. At the top of the Projects area, you can choose between List, Portfolio and Chart. In the Projects List, you will see all projects you are currently a member of, and you can choose to view only projects of a particular status such as active or late. Clicking on a project's name will bring you directly to that project so you can work with the items in it. When you are anywhere within a project itself, you will see the project name in the top left of the screen. You can use the view switcher in the top right to change between list and grid view, as well as choose sorting options. 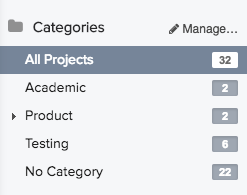 In the top right of the Projects area, you can add a new project, and use the advanced filters to filter the list of projects. 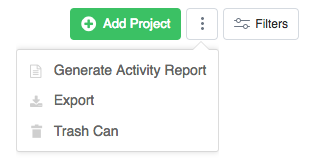 You can also generate an activity report for your projects, export the project list, and view the projects trash can. On the left hand side, you will see any project categories that have been created on your site.